This page is the home of our monthly newsletter called Bumps in the Night!!!! After 6+ years and 75 issues we have decided to hang up our print press and to stop publishing the Bumps in the Night newsletter each month. Starting in January 2017 instead of a full issue like we do now we will publish a new article each month to our website and to Facebook. The publish date will still be the first day of the month. We will rotate topics on a cycle throughout the year. We invite you to check out this next phase and hope you enjoy it. For our devoted readers we say a big THANK YOU and hope you continue to follow us through our next phase of Bumps in the Night!!!! Disclaimer for the Bumps in the Night!!!! newsletter. This disclaimer governs the use of the newsletter and by reading this newsletter, you accept this disclaimer in full. 2017 Issues of Bumps in the Night!!!! NOTE: This will be our last issue of Bumps in the Night!!!! The historical Odd Fellows Home District, also know as Odd Fellows Insane Asylum, located in Liberty Missouri, is a complex of four buildings that housed older people, orphans, and poor people. The complex was run and organized by the Sovereign Grand Lodge Independent Order of Odd Fellows, or the IOOF. The area known as The Bermuda Triangle has been a source of intrigue and mystery for many years. I, for one, cannot hear the word Bermuda without thinking “The Bermuda Triangle”. I have been interested in the paranormal for many years and have wondered what could possibly have caused all of those ships and planes to go missing. There are also reports of missing ships showing up; however the crew is missing without a trace. Is this paranormal in nature? Are there concrete, provable reasons these planes, pilots, ships and crew went missing? If so many people went missing in this area, would that make it one of the most haunted locations? This is a brief technical overview of the Paranormal Puck 2 which is manufactured by Digital Dowsing L.L.C. and sells for $199 on their (or partner) website. This is the replacement for the (now 10 year old) Paranormal Puck 1. It’s a compact device that combines a few key functions into a small handheld rechargeable easy-to-use device that is designed to be used peered with a smart phone, tablet or PC, or run in a limited fashion as an independent device. Construction on the Octagon Hall began in 1847. Andrew Jackson Caldwell chose the octagon shape for it to be a uniquely styled home. The home was completed in 1859 and was bound to become a well known home in Franklin, Kentucky. When talking about Demons, people picture head spinning, pea soup colored vomit spewing across rooms, and malevolent spirits inhabiting people. For the people who investigate the paranormal, our experiences are different. Different religions have different definitions of demons, but most share one simple aspect, none were once human. Simply put, demons are spirits that have never been human. The word demon comes from the ancient Greek word daimōn denotes a spirit or divine power. This is a brief technical overview of the Ovilus 5 which is manufactured by Digital Dowsing L.L.C. and sells for $339 on their (or partner) website. This is the replacement for the Ovilus 4 (which is now out of production along with all other earlier versions). It’s a well know yet controversial type of device that combines a few key functions into a small handheld rechargeable easy-to-use device. The Lizzie Borden House is a Greek revival home built in 1852 by Charles C. Trafton. Just Fifty years after its construction, it became the scene of one of the most notorious murders of the day. Situated at 92 Second Street, Fall River, Massachusetts, it was the home of the Borden Family. The family consisted of Andrew Borden, a banker, his second wife, Abby, and Andrew’s two daughters Lizzie and Emma. Also living in the home was Bridget, the family’s maid. Although the Borden family was very wealthy, they lived in a modest part of town close to Andrew’s office. The concept of indigo children refers to children who possess special or unusual abilities. Sometimes they may even have supernatural traits. Also known as crystal children or star children, the idea of the existence of these children is based on the work of Nancy Ann Tappe, developed in the 1970’s, and further expanded on by Lee Carroll. The popularity of this concept can be found in books and even movies. One such film, Indigo Children, was released in 2012. To read more click here. 2016 Issues of Bumps in the Night!!!! The December 2016 issue #75 of our newsletter, Bumps in the Night!!! !, is now available. This issue contains articles on: Sacred Relics; Alcatraz; on Magnetic Storm Apps; and an interview with interview with investigator Paul Schmidt with The Illinois Paranormalists (TIP). The November 2016 issue #74 of our newsletter, Bumps in the Night!!! !, is now available. This issue contains articles on: Reincarnation; New York Fort Ticonderoga (CC); Geiger Counter; and an interview with investigator Dee Gentile with Orlando Paranormal Investigations. The October 2016 issue #73 of our newsletter, Bumps in the Night!!! !, is now available. This issue contains articles on: Alien Abductions; Preston Castle; Geomagnetometer; and an interview with investigator and author, Sharon Day from Arizona Paranormal Investigators. The September 2016 issue #72 of our newsletter, Bumps in the Night!!! !, is now available. This issue contains articles on: Ley Lines; Sorrel-Weed House; Faraday Cage; and an interview with Marter Paranormal Research Team investigator, Mark Briones. The August 2016 issue #71 of our newsletter, Bumps in the Night!!! !, is now available. This issue contains articles on: Alchemy; Castillo de San Marcos; Footstep Tracker; and an interview with the only rabbi working in the paranormal field, Dr. Sid Vineburg. The July 2016 issue #70 of our newsletter, Bumps in the Night!!! !, is now available. This issue contains articles on: Worm Holes; Old Lincoln County Hospital; Paraspecs Video Glasses; and interview with paranormal investigators and IPRAStrong team David and John. The June 2016 Issue #69 of our newsletter, Bumps in the Night!!! !, is now available. This issue contains articles on: Crop Circles; Gallaher Mansion; EDI Meter; and an interview with paranormal investigator Nick Sarlo. The May 2016 issue #68 of our newsletter, Bumps in the Night!!! !, is now available. This issue contains articles on: Vortexes; Burn Brae Mansion; Rountree Voice Phenomena Recorder (RVPR); and The Challenge of Eternal Life. The April 2016 issue of our newsletter, Bumps in the Night!!! !, is now available. This issue contains articles on: Canine Paranormal Investigators; Manresa Castle; ION Counters; We are the People We've Been Waiting For; and an interview with paranormal author and tour owner Ursula Bielski. The March 2016 issue of our newsletter, Bumps in the Night!!! !, is now available. This issue contains articles on: Movies and Their Impact on the Paranormal; Magnolia Manor; 3 Powerful Ways to Cleanse and Recharge Your Energetic Body; and an interview with paranormal investigator Luann Joly from Whaling City Ghosts. The February 2016 issue of our newsletter, Bumps in the Night!!! !, is now available. This issue contains articles on: Religion and the Paranormal and Supernatural; Beauvoir, Biloxi, MS; GhostArk; and features two interviews this month: Jacque Bowling, Clairvoyant Intuitive Medium, and Jen Chichester founder, lead investigator, and case manager of Grand Rapids Paranormal Investigation. The January 2016 issue of our newsletter, Bumps in the Night!!! !, is now available. In this issue look for articles on: Responsibilities and Ethics of Paranormal Investigating, Gettysburg, IR Lights, 5 Ways Our Ancestors Used To Get Rid of Headaches Naturally, and an interview with author and paranormal investigator Pat Fitzhugh. 2015 Issues of Bumps in the Night!!!! The December 2015 issue of our newsletter, Bumps in the Night!!! !, is now available. In this issue look for articles on: Munchausen Syndrome, Bachelors Grove in Midlothian, IL, Thermal Imaging Camera , Which Of The 7 Stages of Spiritual Awakening Did You Experience?, and an interview Anthony Mamone of Kissimmee Paranormal Investigations. The November 2015 issue of our newsletter, Bumps in the Night!!! !, is now available. In this issue look for articles on: Energy Vampires, Haunted St. Charles IL, Paranormal TV Overview, Honoring the Spirit is Possible, and an interview with Jeffrey Vaughan founder and lead investigator for Paranormal Society of Middle Georgia. The October 2015 issue of our newsletter, Bumps in the Night!!! !, is now available. In this issue look for articles on: Feedback from a Newbie, Elgin Casket Factory, Ghost Hunting on the Cheap, Karma: Not the “Mainstream” Version – The Real One, Bachelors Grove Cemetery, and an interview with Eric Perry founder of Central New Hampshire Paranormal Society. The September 2015 issue of our newsletter, Bumps in the Night!!! !, is now available. In this issue look for articles on: Listeria, Mineral Springs Hotel, Rechargeable Batteries and Battery Packs, Shadow of a Shaman, and an interview with Michele and Dave Diener with Badger State Paranormal. The August 2015 issue of our newsletter, Bumps in the Night!!! !, is now available. In this issue look for articles on: Top 5 Haunted Places in IL We Have Investigated According To Data Collected; Haunted R Theatre, Auburn, IL; Thermometers; Can you, or do you really trust your Gut Feelings or Body's reactions? ; and an interview with Brian Murray with Riverbend Paranormal. The June 2015 issue of our newsletter, Bumps in the Night!!! !, is now available. In this issue look for articles on: Data Cross Reference Technique; Rossville Opera House; Tools Used in the Early Days of Ghost Hunting; Paranormal Insight; a write-up of a day investigation at Ashmore Estates; and an interview featuring John McColgan with Unexplained Paranormal Research. The May 2015 issue of our newsletter, Bumps in the Night!!! !, is now available. In this issue look for articles on: Cryptids; Manteno State Hospital; Parabolic Mic; What is the most dangerous thing about being a paranormal investigator? ; 5 Things Happy People do Before Getting out of Bed Each Morning; Paranormal Insight; and an interview featuring Marie Cuff from International Paranormal Reporting Group. The April 2015 issue of our newsletter, Bumps in the Night!!! !, is now available. In this issue look for articles on: Mass Hysteria Effect; Arlington Heights Historical Museum; Paranormal Podcast Review; and an interview with Kevin Clayton from our MO Chapter, aka Limbo Paranormal. The March 2015 issue of our newsletter, Bumps in the Night!!! !, is now available. This issue includes the following articles: In this issue look for articles on: Responsibilities, Obligations, and Ethics; Bowen Building; Little Known, but Useful Tools; Paranormal Corner by Chad Stambaugh; a new column by Bruce Cline called History, Mystery and Hauntings of Southern Illinois; Paranormal Insight by Becky Guymon; and an interview with Jann Obermeier, TnT Paranormal – WI Chapter. The February 2015 issue of our newsletter, Bumps in the Night!!! !, is now available. This issue includes the following articles: Safety series: Histoplasmosis; Old South Pittsburg Hospital; Use of Non-English Languages; Are you afraid of Death? ; and an interview with Nick West from Paranormal R.E.A.C.H. The January 2015 issue of our newsletter, Bumps in the Night!!! !, is now available. This issue includes the following articles: Non-Human Entities; McRaven Home; Nerd Gun (Oscilloscope); The Prizes of Science and Skepticism; and an interview with Gavin Kelly from Phantasmic Ghost Hunters. 2014 Issues of Bumps in the Night!!!! The December 2014 issue of our newsletter, Bumps in the Night!!! !, is now available. This issue includes the following articles: What is Jinn? ; The Whaley House; EchoVox; The Most Perilous Job; and an interview of Elaine Davison with Paranormal Safety. The November 2014 issue of our newsletter, Bumps in the Night!!! !, is now available. This issue includes the following articles: What is Santeria? ; West Virginia Penitentiary, aka Moundsville; Photography 101; Happy Halloween; and an interview of Justin Brown from Interface Death. The October 2014 issue of our newsletter, Bumps in the Night!!! !, is now available. This issue includes the following articles: Children Perception and the Paranormal; Senator Humphrey House; Researching Tools; Paranormal Insight; My Science is Bigger than Your Science; and an interview of Frank Lee from C.A.S.P.I.R. The September 2014 issue of our newsletter, Bumps in the Night!!! !, is now available. This issue includes the following articles: Overview of Early Ghost Hunters; Bartonsville State Hospital; Websites with Useful Data; Paranormal Insight; Is it Worth Chasing Folklore? ; and an interview of Ryan Jones from All Seeing Paranormal Society. The August 2014 issue of our newsletter, Bumps in the Night!!! !, is now available. This issue includes the following articles: Normal Home False Positives; Crescent Moon Hotel; Safety First; Paranormal Insight (NEW column); At Face Value: A Pareidolia Formula?! ; Dangers of Paranormal Investigating; Ghosts: Do They Exist, A Theory; 2014 Paravan Trip Report; and an interview of John Karle, Founder and Lead Investigator with JABA Paranormal. The July 2014 issue of our newsletter, Bumps in the Night!!! !, is now available. This issue includes the following articles: Just the Basics, St. Augustine Lighthouse, an interview of Robbin Terry, owner of Haunted “R” Theater and Ashmore Estates, Dowsing Rods/Crystals vs KII/Ghost Meters, and Seeing is Believing. As well as new columns by Chad Stambaugh (Paranormal Corner) and Kathy Covey (Paranormal Short Stories). The June 2014 issue of our newsletter, Bumps in the Night!!! !, is now available. This issue includes articles on the Tibetan Book of the Dead; Eastern State Penitentiary; an interview of fellow investigator, Cameron Ellis, founding member of SPARC (Society for Para-Analytics, Research & Collaboration); Basics of the Video File Format; REINCARNATION: Not Just Buddhist Philosophy Anymore; Near Death Experiences; and much, much, more. The May 2014 issue of our newsletter, Bumps in the Night!!!! , is now available. This issue includes articles on History of the Paranormal; USS North Carolina; Comparison of Analog and IR Cameras; an interview with investigator Colleen Carroll, Founder and Investigator with All Seeing Paranormal; The Unseen World; and much, much, more. The April 2014 issue of our newsletter, Bumps in the Night!!! !, is now available. This issue includes articles on Devil's Toy Box, Pollak Hospital, How to Shield a Motion Detector; an interview with investigator Darrell Boyd; and much, much, more. The March 2014 issue of our newsletter, Bumps in the Night!!! !, is now available. This issue includes articles on TheWitching Hour, Rolling Hills Asylum, Natural EM Meter, an interview with paranormal author Dane Ladwig, a summary of a recent trip to Key West, and much more. The February 2014 issue of our newsletter, Bumps in the Night!!! !, is now available. This issue includes articles on Epilepsy and the Paranormal, Whispers Estate, Explanation of Light and Audio Ranges, an interview with paranormal investigator Michelle Lemire, and much more. The January 2014 issue of our newsletter, Bumps in the Night!!! !, is now available. This issue includes articles on: Dybbuk Box; the haunted Crump Theatre; Photography Dos and Dont's; and interview with paranormal investigator Rob Depew; and much more. 2013 Issues of Bumps in the Night!!!! The December 2013 issue Bumps in the Night!!!! includes articles on: Mediums and Psychics; the haunted Buffalo Central Terminal; Paranormal Investigating with a Mac; an interview with author and paranormal investigator Chad Stambaugh; and much more. The November 2013 issue of Bumps in the Night!!!! includes articles on: Protection; Spaulding Inn; Interview with Noah Leigh from PIM; Audio File Formats; and much, much, more. The October 2013 issue of Bumps in the Night!!!! includes articles on: Day of the Dead; Video File Formats; Fort Mifflin; an interview with Stephen Lambert the Extreme Ghost Hunter; and much, much, more. The September 2013 issue of Bumps in the Night!!!! includes articles on: Shamans; Old City Jail; Interview with Paul Green, the Psychic Biker; Video Camera Technologies; and much more. The August 2013 issue of Bumps in the Night!!!! includes articles on: Use of Sage and Crystals; Bobby Mackey's Music World; Interview with author Sylvia Shults; Video Review for Beginners; pictures from our paravan; and much, more. The July 2013 issue of Bumps in the Night!!!! includes articles on: Sensations and Perception - Hearing; Mark Twain Museum; Interview with Drake Spaeth; How far is too Far? ; Audio Review for Beginners; and much, much, more. The June 2013 issue of Bumps in the Night!!!! includes articles on: Power of the Moon; Raven's Grin Inn; Interview with Paranormal Investigator Nik Kousoulas; Humidity Sensor; and much more. The May 2013 issue of Bumps in the Night!!!! includes articles on: Baseline Readings; The Whaley House Museum; Interview with the Ghost Gadget Guy, Michael Kravchuk; Shadow Detectors/Sensors; and much more. The April 2013 issue of Bumps in the Night!!!! includes articles on: Understanding Humidity; Egyptian Theatre; and Interview with One Foot Out of the Grave's Jeff Rezman; Other Useful Tools; Returning to Waverly Hills; and much more. The March 2013 issue of Bumps in the Night!!!! includes articles on: Ambient versus Surface Temperatures; Queen Mary; Interview with Author and Paranormal Investigator Dale Kaczmark (this is for our NEW column called TnT Paranormal Asks); Understanding EXIF data for digital pictures; and more. The February 2013 issue of Bumps in the Night!!!! includes articles on: EVP versus DVP; Bell Witch Cave; Using a Barometric Pressure Gauge (aka Barometer); and much more. The January 2013 issue of Bumps in the Night!!!! includes articles on: History of the Ouija Board; The Myrtles Plantation; E-Pod; What is a Shaman? ; and much more. 2012 Issues of Bumps in the Night!!!! The December 2012 issue of Bumps in the Night!!!! includes articles on: Who is the Thin Man? ; Willow Creek Farm; Inductive Amplifier; What is red brick dust used for? ; and much more. The November 2012 issue of Bumps in the Night!!!! includes articles on: Debunking Tips; The Joplin SpookLight; Interview with Author Michael Kleen; Laser Pen/Grid; and much more. The October 2012 issue of Bumps in the Night!!!! includes articles on: Understanding Sleep Disorders; Pythian Castle; Data Loggers; Language of the Dead; and much more. The September 2012 issue of Bumps in the Night!!!! includes articles on: Origins of Halloween; Milton School; Ovilus; Shadow People; Near Death Experience; and much more. The August 2012 issue of Bumps in the Night!!!! includes articles on: What is Matrixing and Pareidolia? ; Missouri State Penitentiary; Provoking versus Trigger Object; Cell Phone Apps; and much more. The July 2012 issue of Bumps in the Night!!!! includes articles on: What are Orbs? ; Lemp Mansion; Human Mind; A Twinless Twin; 12/21/2012 - Is the end near? ; Real or Imagined; and much more. There was not a June 2012 issue of Bumps in the Night!!!! The May 2012 issue of Bumps in the Night!!!! includes articles on: What is better. Hunting Ghosts in the Day or Night? ; Winchester Mansion; Video Software; Negative Energy; Hardest Thing; and much more. The April 2012 issue of Bumps in the Night!!!! includes articles on: Friday the 13th; The Stanley Hotel; Thermometers; A String of Belief; and much more. The March 2012 issue of Bumps in the Night!!!! includes articles on: Glowing Plants and Fungi; Whisper Estates; Parabolic Microphone; Psychic Senses; and much more. The February 2012 issue of Bumps in the Night!!!! includes articles on: Audio Frequencies and Ranges; Black Moon Manor; EM Pump; Haunted Tourism; That Feeling; and much more. The January 2012 issue of Bumps in the Night!!!! includes articles on: Black Eyed Kids (BEK); Ashmore Estates; Kestrel; The Demon Within; From Searching for Ghosts to Searching for Answers; and much more. 2011 Issues of Bumps in the Night!!!! The December 2011 issue of Bumps in the Night!!!! includes articles on: Light Spectrum; Tinker Swiss Cottage and Museum; Full Spectrum Camera; Witness Credibility; Trigger Objects versus Provoking; and much more. The November 2011 issue of Bumps in the Night!!!! includes articles on: Dangers of EMFs; Trans-Alleghey Lunatic Asylum (Western State Hospital); Psychology 101; What is the Origin of All Hallows Eve; Photo Software; and much more. The October 2011 issue of Bumps in the Night!!!! includes articles on: Dirty Electricity; Eastern State Prison; Camcorders with Night Vision; The Forgotten Spirit; What can you tell me about Sidhe? ; and much more. The September 2011 issue of Bumps in the Night!!! includes articles on: Ghost Hunting: Hunting for the Paranormal or Supernatural? ; Milton School; Audio Recorders; What are IR and UV? ; Friends in Dark Places; and much more. The August 2011 issue of Bumps in the Night!!!! includes articles on: Asbestos; American Legion in Shelbyville; Audio Software; What Digital Recorder is the best? ; New to Paranormal Investigating; and much more. The July 2011 issue of Bumps in the Night!!!! includes articles on: Shadow People; McPike Mansion; DVR System and IR Cameras; Intelligent Hauntings; EVP Types; The Doppelganger Effect; Audio-Things to be aware of!!! ; and much more. The June 2011 issue of Bumps in the Night!!!! includes articles on: Doppelgangers - What are they? ; Ohio State Reformatory (OSR), aka Mansfield; Poltergeists; KII and Ghost Meters; Pareidolia; Paranormal Photography Tips; and much more. The May 2011 issue of Bumps in the Night!!!! includes articles on: Carbon Monoxide and Delayed Neurological Syndrome; Morgan Cottage; Basic Tools; Fear Cages; Who ya gonna call? (new Paranormal Talk column); and much more. The April 2011 issue of Bumps in the Night!!!! includes articles on: Research Techniques; Villisca Axe Murder House; Zoom Handy Recorders; Only a Fool Believes! ; and much more. The March 2011 issue of Bumps in the Night!!!! includes articles on: Data Cross Reference Technique; Waverly Hills Sanatorium (WHS) (new column: Famous Haunts); Mel-Meter (new column: Tools of the Trade); Creeping; Ouija Boards; and much more. The February 2011 issue of Bumps in the Night!!!! includes articles on: Tips for Audio Gathering; What is a Residual Haunting? ; and much more. The January 2011 issue of Bumps in the Night!!!! includes articles on: Trespassing ? Should NOT be taken lightly; What is an EMF and why is it important in the field of paranormal? ; and much more..
2010 Issues of Bumps in the Night!!!! The December 2010 issue of Bumps in the Night!!!! includes articles on: How to check if your house is haunted and much more. The November 2010 issue of Bumps in the Night!!!! includes articles on: Matrixing ? What is it? ; Countryside Place ? The history; and much more. The October 2010 issue of Bumps in the Night!!!! includes articles on: Investigations - Just the basics and much more. The September 2010 issue of Bumps in the Night!!!! includes articles on: Trespassing ? Should NOT be taken lightly; What is an EMF and why is it important in the field of paranormal? ; and much more. The August 2010 issue of Bumps in the Night!!!! includes articles on: Paravan to Waverly Hills and McPike Mansion;Types of Hauntings; and much more. More information about Bumps in the Night!!!! 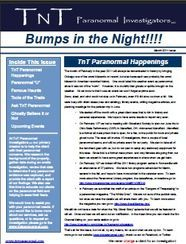 We at TnT Paranormal Investigators LLC offer a FREE monthly newsletter, called Bumps in the Night!!!!,. The newsletter will be emailed out to those parties that choose to subscribe and/or opt in, as well as, will be available on our website on Bumps in the Night page. The primary purpose of the newsletter is to provide education on topics related to the paranormal. TnT Paranormal Happenings - Focusing on what we at TnT Paranormal are doing. This is normally a page or less. Paranormal "U"- Articles on paranormal related topics meant to educate the reader on the paranormal. This is written as informational and not the opinion of the author. These articles are at least 1 page in length, but could be more. Famous Haunts - Articles where each month we feature information on a "Known" or "Famous" Haunted location. Tools of the Trade - Articles on a tool, technology, and/or process that is used in the paranormal field. This is written as informational and not the opinion of the author. These articles are at least 1 page in length, but could be more. TnT Paranormal Asks - Interview each month of a person who works in the paranormal field. We ask each interviewee the same ten (10) questions. Ask TnT Paranormal - Featuring questions we have received from others related to the paranormal. This column is informational, but can feature opinions of the author. Ghostly Believe it or Not! - Featuring ghost stories from our readers, family, or friends. We do not have an article for this column each month. What on Your Mind - Featuring an article that is based on the opinion of the author. We do not have an article for this column each month. Paranormal Talk with Rev. Kathy - Featuring an article from columnist Reverend Kathy. This column is informational and is the opinion of the author. Paranormal Fiction - Featuring a paranormal related short story written by various authors. We do not have an article for this column each month. Upcoming TnT Paranormal Events - A list of all of our public or pay events coming up. Upcoming Paranormal Events - A list of events that are either in the area and/or given by big name groups like TAPS or Nightwatchers. From the Paranormal Bookstore (or Videostore) - Feature a book(s) or video(s) each month. Investigator Spotlight - Each month we will feature a small piece on a different team member so that you can get to know us better. If would be interested in receiving this newsletter please email us and indicate that you are "Opting In" to the newsletter. Also, if you can think of topics you would like to see information on or have someone you can think of that might be interested in receiving the newsletter, please let us know.